In my last post I discussed the principles of special relativity. To recap, the speed of light is invariant for all observers in all reference frames. Special relativity tends to deal specifically for non-accelerating frames of reference, what we call an "inertial frame". General relativity is much more in depth regarding reference frames and can account for accelerating frames of reference. General relativity was published by Einstein 10years after his special relativity and it went somewhat deeper. The laws of physics up until this point were governed specifically by Issac Newtons Laws of Motion. Newton's First Law of Motion is the Law of Inertia, and the Second Law of Motion expresses the relationship between force, mass and acceleration (F =MA). The Third Law of Motion states that "for every action, there is an equal and opposite reaction." For centuries prior to Einstein's work, the force of Gravity has always puzzled mathematicians and physicists. There are 4 fundamental forces that govern the laws of nature and the building blocks of the universe; the strong nuclear force, the weak nuclear force, electromagnetism and gravity. For now I am going to focus on gravity. Out of the four main forces of nature, gravitation is the weakest. When I say the weakest, it is the weakest by far. Lets think about this, we are taught in our science classes that the solar system orbits the centre of the galaxy, the planets orbit our sun and the moon orbits our planet due to "gravity". The mass of our galaxy is 0.8–1.5×10 12 M☉. The symbol after the M in scientific notation is Solar Masses. That is 0.8 times -1.5 times 10 to the 12th power. That is literally hundreds of billions and quintillions of kilograms. Despite the force of gravity keeping our solar system and stars orbiting the centre of the galaxy, if you raise your arm in the air or jump, you are literally overcoming gravity! Now that I explain it this way, it is clear the notion of gravity is flawed. This is what inspired Einstein to come up with a new theory of gravitation, namely General Relativity. General Relativity is an extremely complex subject and I am going to try and articulate the key concepts of the theory which gives us a more complete understanding of the workings of the cosmos. The story of the origin of gravity was a falling apple hitting Issac Newton on the head as he sat under a tree near his home. Did that apple fall to the ground? Or did the ground and everything on it accelerate upward into the apple? I know what I just said sounds absolutely ridiculous and maybe even moronic but wait! This analogy presents gravity as a downward force. If you are in a car and you press the accelerator hard, it gives you an impression that there is a backward force pushing you into your seat. If are in a lift travelling upward, either in a building or deep space, that upward force will keep you on the floor of the lift. This was a revelation for Einstein when he discovered this. Lets discuss frames of reference again for the apple, the way we determine an inertial frame is we hold it in our hand and let go. If this apple stays where it is, it is an intertial frame. It is impossible to tell or discount that the apple is indeed stationary, and the ground accelerated upward into the apple. So if we take the acceleration force of the car, coupled with the falling apple, this suggests that "gravity" can be both down and toward. So what direction does "gravity" pull, in and down? This places gravity as radially inward as opposed to strictly down. If two apples fall off a massively tall tree, they will eventually accelerate toward one another. So what causes this to happen? A concept involving Curved Spacetime. Oh Boy! Curved Spacetime? The fabric of space is Spacetime, as explained in the previous post. Massive objects curve and distort the spacetime around it. In Physics we call this a Gravity Well. I will repeat the example of the Sun as a bowling ball and the fabric of spacetime as a rubber sheet. Massive objects can change the direction of light/photons, as they travel around the curve of the object. This was tested using a solar eclipse, when photographed it was able to show the gravitational lensing effect of a star that was positioned behind the sun! In the astronomers photograph, a star which was behind the sun was observed beside the sun. This is because the light from the star travelled toward the sun, the curvature of spacetime around the sun presented the star beside the sun. So if this is gravity debunked, why is it still discussed? Technically speaking, Newtons Laws of Motion are still somwhat consistent and have been used by Space Programmes to launch probes and rockets into Space. 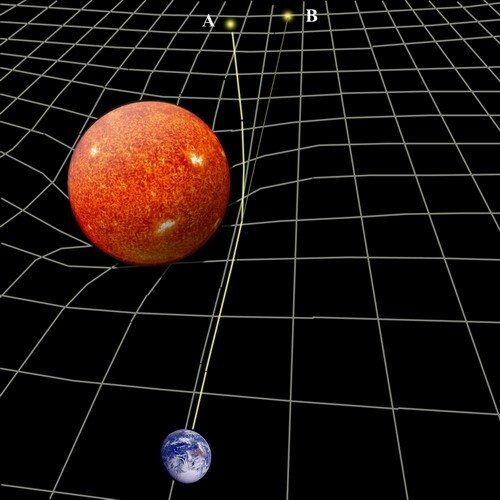 Physicists still use the word "gravity", it is simpler than saying that all falling objects take a single speed straight line path through a curved spacetime. Bit of a mouthful. Gravity as such is a crutch that should be used with caution. All tests associated with relativity have passed their experimental tests, most recently the detection of gravitiational waves by LIGO. The collision of two blackholes caused ripples in the fabric of space that was detectable to us here on Earth. So the apple/Earth followed a single speed straight line through a curved spacetime. Within this regard, the apple doesnt fall to the ground, the ground and everything on it accelerates upward into the apple.